Memorial Day Weekend Saturday May 26th and Sunday May 27th 2018. Two days of non shop Irish music, food and fun at the Michael J. Quill Irish Cultural and Sports Centre. Enjoy the Biggest line up to date including Shilelagh Law, Andy Cooney, The Narrowbacks, NineMile House and back by popular demand, direct from Ireland – The Whistlin’ Donkeys plus many more! See the full lineup at EastDurhamIrishFestival.com and Purchase your tickets now and Save. Enjoy an intimate drink at our Beer Garden. The heritage tent will feature Irish plays with young musicians and artists as well as Workshops in Song and Dance. The “Woman of the House” provides Irish Hospitality with tea and scones in the Authentic Donegal thatched cottage. Bring the Family- Little ones can enjoy the Amusement Park and petting zoo. Vendors selling Irish food and goods are everywhere. Festival goers can walk on the World’s largest map of Ireland made entirely out of bricks. 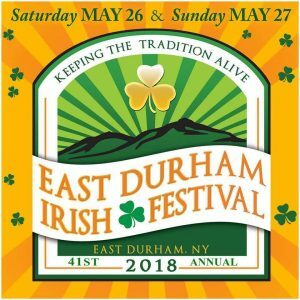 Join us as we continue to Keep the Irish American Tradition Alive in East Durham and The Great Northern Catskills.